Sony Xperia Touch Projector. Introduction to Future of Technology? Sony, A company which is always in the front line when it comes to introducing new technology to the world with best of performance and durability. Sony gave a glimpse of its new innovation Xperia Touch Projector during last year's Mobile World Congress and since then we haven't heard much about it, and about a year later they came up with the device's name and launch date. It is called "Xperia Touch" and it is a part speaker, part projector and a virtual tablet with android integrated into it. It is expected to go on sale for about 1500€ or 1700$ and it's expensive and it is available this Spring starting with European countries and then enter into the USA. 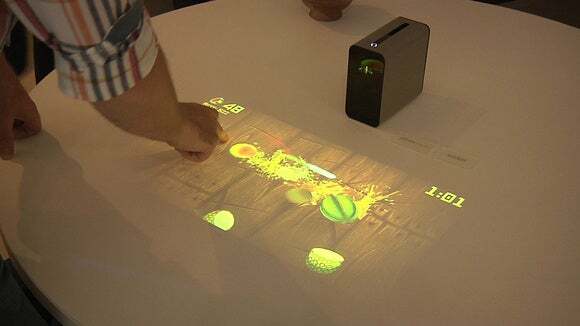 It all actually sounds great when we listen that we can use an Android device by projecting screen on any surface, I mean this could be the future of all the devices and making this a start of it we could expect a lot in the coming future. It has the best Android experience, we can really enjoy multiplayer games and also takes the gaming experience to another level. It recognizes Voice inputs like "Ok Google" and It'll hear your voice for Google Assistant commands and recognize your hand gestures to wake up its screen if it goes to sleep. It carries a 13MP camera shooter for Skype calls and selfies. Stereo speaker produces a decent amount of sound and is good in video calls and listening to music. It comes with a battery backup of 1hr and can be charged. It doesn't really do the justice to the money if you are planning on watching TV or YouTube because the screen resolution could go up to 1366 x 768 which is not very sharp and could go up to 80 Inch through expansion. When coming to use it as an Android device, it could be something to look forward to as far as the touch on the screen projected is accurate when it comes to the smooth surfaces like a wall or table. Even a slight shake of the device makes it close the screen and takes about 3 to 4 seconds to display again, which can be a minor glitch. The touch input here has no sensory feedback at all, especially within a game. Nothing vibrates or lights up under your fingers to tell you that your touch has been registered. It makes you think if the touch has been registered or not. The charging cable is so short and have to carry extension cable. It totally depends on you, if you are looking for a futuristic technology this stands out of the crowd. At $1700 it is aggressively priced, and in this price range we can opt for there are several other options, such as Lenovo's Yoga Tablet 2 Pro or the Moto Z with projector Mod and others. But this is a device which is a combination of 3 other devices into one and is doing a pretty good job with what is provided to it.